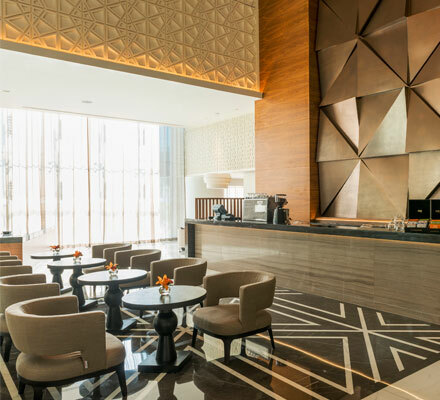 This Victorian tradition which has resonated throughout the decades, is being adapted in modern culture, and has now come to one of the newest cafés in the city — the Links@Sheraton Café, which is set in the lobby lounge of the brand new Sheraton Grand Hotel. The bright, spacious café features contemporary décor with velvet couches adding a touch of elegance. Since afternoon tea is one of those things you can really enjoy with your mum, I took my mother along, and we both loved the amuse bouche made with wild berries and yuzu posset, topped with a shortbread, that got our palates ready for the afternoon’s indulgences. This was followed by freshly brewed tea – my mother opted for the Strawberry and Mango tea, which was nice and fruity – while I had the Sencha, a kind of green tea that originated in Japan, customised with a dash of mint leaves. The teas were served in lovely glass teapots, with two sets of three-tier pastry tower which included a delectable assortment of finger sandwiches, freshly-made scones, cakes and pastries. Although the sandwiches and pastries were mini portions, overall it added up to be undeniably satisfying. My favourites were the coronation chicken in Viennese roll, which was absolutely gorgeous as it had the right blend of savoury and citrusy taste to it; and the smoked salmon with crab and avocado mayonnaise, which was fresh and delightful. We also enjoyed the unique flavour of the date, lemon and hazelnut Batternberg cake, as well as the classic pleasure of their fresh scones too, which was perfectly made and went well with the Devonshire clotted cream. You can really take your time working your way through the array of goodies, as the tea is re-fillable until you’ve finished the whole tower, and for those who prefer, they also have a selection of freshly brewed coffees. If you want to go: Dhs160 per person. Call 04-5034444.